This is not your average loaded sweet potato fries recipe! The spiced chickpeas and red cabbage add a lovely crunch with the lettuce and beetroot ketchup bringing an incredible colour to the dish. You could half this recipe for a delicious side for two people or present this for friends at a dinner party. It is so flavoursome and packed full of nutritious ingredients! Place the Oven Baked Sweet Potato Fries on a baking tray and cook as per instructions on the pack. Open the chickpeas and drain. Make sure to rinse thoroughly. Place on a baking tray and add the spices and salt. Place both the Oven Baked Sweet Potato Fries and chickpeas in the oven from approximately 25 minutes. Shaking halfway through to ensure they cook evenly. In the meantime, chop the red cabbage. 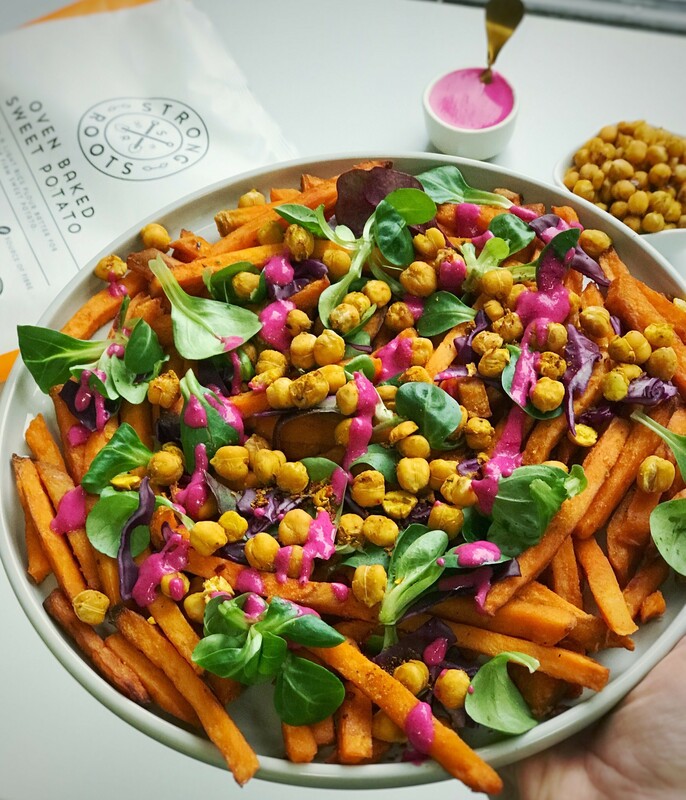 Once the fries and chickpeas are cooked, arrange in a bowl with the red cabbage, lamb’s lettuce, squeeze of lemon juice and a drizzle of your desired dressing.